Most people want to live a life full of vitality. However, many things get in the way to allow them to have a healthy, enjoyable life. People have a wide variety of ailments, that do not allow them to thrive in their lives; anything, from toxic environments (wither it be, their living or working environments), to fatigue and stress, to disease, even a poor diet can affect your vitality. 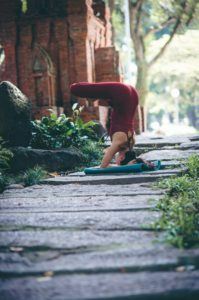 Probably you have heard about yoga and what it can do for your general well-being, vitality and yoga being topics that are often taught together. However, apart from yoga, there are many different ways for a person to increase the vitality in their life. Some simple things to do to help increase your vitality are to detox your body by changing your diet or by adding certain things to it. One way to detox your body is to drink tea. Some teas contain certain herbs, (like milk thistle and dandelion), that will help to purify certain body parts (like blood cells and organs). Adding kale, spinach, collard greens or any other leafy vegetables, you will increase the amount of vitamins and minerals in your diet. The leafy vegetables can support your immune systems and reduce inflammation; along, with detoxifying your body. Another way to increase your vitality is by connecting all three aspects (mental, spiritual and physical) of self. But an incredible way to increase your vitality is the practice of yoga. Yoga is a system that combines the disciplines of mental, spiritual and physical practices. In some non-Western society, yoga is practiced, as one would practice religion. According to philosophical traditions of ancient India, there are six orthodox schools of Hindu. These schools are Sankhya, Mimamsa, Nyaya, Vaisheshika, Vedanta and Yoga. It is hypothesized that yoga was brought about around the 5th and 6th centuries BCE. However, it didn’t gain popularity in Western cultures until the late 19th and early 20th centuries; when, Swami Vivekananda imported Hatha yoga. There are many different forms of yoga. It does not matter what version of yoga you chose; you will increase your vitality with the practice of yoga. As stated before, there are plenty of different forms of yoga. Hatha yoga is considered an “umbrella” term for many different forms of yoga because it includes any form of yoga that contains physical postures. There are two translations of Hatha; one is that it’s a willful manipulation of one’s body. The other translation is a balance of yoga, with Ha meaning sun and Tha meaning moon. Hatha yoga is one of the best practices for beginners because it is a slower paced practice and it teaches the basics. Also, Hatha yoga combines classic techniques with breathing. Hatha yoga helps to coordinate the three parts of yourself; along with making you feel tranquil. Iyengar yoga was founded by BKS Iyengar. One of its main objectives is alignment, with well-structured movements. Yogis that are detail-oriented would love this yoga. Iyengar yoga is also great for people who have some injuries and is very therapeutic for certain circumstances. The postures are held for slower, longer periods of time; along, with being modified by using props, such as blocks, blankets, straps, etc. Kundalini yoga is an energetic, agile exercise. You will be working on reaching the Kundalini (the critical energy or life force, that lives within us all) energy that lives entwined at the base of the spine. During your Kundalini class, you will do duplicated routines with intense breathing routines. You can also find yourself doing meditation, chanting and/or singing. One important aspect of Kundalini is that you will open yourself up to a more complex self-awareness and personal vitality. If you are looking for a more formal yoga practice and are a more advanced yogi, Ashtanga yoga would be for you. It was founded by K. Pattabhi Jois and is extremely demanding. It works wonders for toning the body and working your core. Vinyasa yoga is a modified form of yoga. It is like Hatha yoga because it incorporates many different styles, such as Ashtanga, prana, and power. Parts of Vinyasa where taken from Ashtanga, such as the coordinated movements and the flow from one movement to another. If you want to sweat it out, Bikram yoga is just for you. You will be in a brightly lit, carpeted room, it will be heated up to 105 degrees F and the humidity will be set at 40 percent. There will be a progression of 26 particular poses, twice and the classes run 90 minutes. Yin yoga is another yoga which is great for beginners. It is slower paced and most positions are done in a seated position. The classes are very relaxed, with poses being held for a longer time period. It also, allows gravity to do the “hard” work. Yin yoga also is great for meditation and finding your inner peace. If you need a soothing, laid-back yoga, restorative yoga is just what you need. This class is great for everyone, from beginners to advanced yogis. Restorative yoga is altered so it is more accessible and calming for yogis. You will use props to help you free your mind and get into a deeper relaxed state. If you are a woman who is pregnant and want to be able to stay working out, prenatal yoga is for you. All moves have been altered for women in all trimesters. Anusara yoga is a contemporary version of Hatha. It was founded by John Friend and is based on the connection of the mind-body-heart. You will learn about finding your center and aligning your body. You will also work each body part the way they should be worked. Another form of yoga is Jivamukti. It was founded in 1984 by Sharon Ganon and David Life. Jivamukti is based on Hindu traditional spiritual teachings and how you are connected to the world around you. There is also an emphasis on Mother Earth and how she is a living creature. Most of the poses that are used in Jivamukti follow the Vinyasa forms. There are many different forms and each form will help you increase your vitality with the practice of yoga. One website that will help you increase your vitality with the practice of yoga is www.zenward.com. 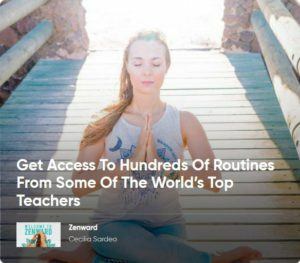 Zenward’s mission is to build a community that embraces your individual yoga practice and enables yogis to share their ideas, get guidance as well as support. It promotes the best practices and tries to keep all the members informed with respect to the latest yoga innovations. Zenward aims at contributing to the progress of humankind, so everyone can live their best life. They are a global, changing form of education. Zenward believes that everyone from infant to adult can benefit from their innovative, holistic techniques. They offer online schools, health and fitness programs, and apps. Students are able to use all forms of technologies to connect to their programs. Basically, they are combining yoga content with technology to get their message out. The instructors are passionate and world leaders in yoga. They believe that anyone, (no matter their fitness level, mindset, body type or age), can do yoga. You are given a personalized course that is based on your needs as well as your experience level in yoga, no one size fits all program. Zenward also allows you to go at your own pace; however, they do have a supportive community (besides your instructors) that will reach out to you and help you along with your journey. You will also receive guidance and weekly reminds from your instructors so you can reach your goals. A few of your world renowned instructors are Kino MacGregor, Richard Schultz, and Dashama Gordon. Kino MacGregor is an Ashtanga yoga instructor. She has taught Ashtanga for more than 15 years and received her certificate from Ski K. PattabhiJois, the founder of Ashtanga yoga. Richard Schultz teaches traditional Hatha yoga, Vinyasa flow, and Iyengar yoga. He studied at Vivekananda Yoga Institute and received his certificate from Yoga Master Bharath Shetty. Schultz is also a member of the Yoga Alliance and also has a certificate in anatomy and physiology. Dashama Gordon is a life transformer and innovator of the mind and body wellness program called Paddle Board (SUP) yoga. Gordon is also the founder of the Pranashama Yoga Institute; along, with being the CEO of Perfect 10 Lifestyle. 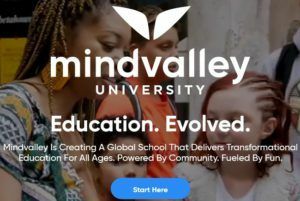 Zenward is also part of the Mindvalley Academy. It is also considered one of the first online universities to transform education. It uses platforms that are changing the way people view education. One of the ways it does this is by adding mindfulness into its programs. They also use a platform that they call “peer to peer,” which allows students from all over the world to connect with one and another. This allows their students to not only learn from one and another but also to network with each other. They believe that education is lifelong and you should constantly be learning. Mindvalley believes that education should never be boring; it should be fun and rewarding. They also consider that the more fun and rewarding education is the more a person is going to want to learn and more people will also want to learn. They also believe in the fact that education should not only grow you mentally but also spiritually and physically as well. Zenward offers different types of yoga programs for a person to study and learn. With each one, you will increase your vitality with the practice of yoga. After you take your initial class, you will be able to find other specialized classes, such as their 30-Day Challenge, Shred Those Pounds or Sensual Yoga. If you want to increase your vitality, have a healthier and happier life, you should check out what Zenward can do for you.